A good night’s rest, some Belgian fries, beer and we’re back to the festival just in time to see The Vintage Caravan open the main stage. This Icelandic band is quite entertaining live and easily engageable with the public. The drums provided the spacial heaviness ripping all throughout their time slot giving the retro band a modern twist. Perfect act to fill the audience with good energy and mood for the rest of the day. We left before we could listen to "Expand Your Mind" due to the newcomers Elephant Tree that were about to begin at Vulture Stage. After we previously missed them in London, this time we marked them as a must-see and by the time we arrived, a packed and sweaty Vulture already was awaiting for them. Their sound is quite unique and fills the air with lots of freshness and shifts between moods, grooves and riffs. All we can say is: Good lungs on that kid. As we got back to the Desert Stage, a group of devoted fans already awaits Stoned Jesus as they finish their soundcheck. They are still playing Seven Thunders Roar in full but at each gig they add some clever nuances that makes every single time we see Stoned Jesus a new and bombastic experience, just like it was the first time ever. That shows just how much at ease and true masters of their instruments they really are. What a performance! The crowd is as enthusiastic as a little kid in Christmas that couldn’t almost contain from belching out the words before Igor did. “Electric Mistress” at live is truly an exploding sensation which can make everyone shake their skeletons and “Indian” has some of the catchiest bass lines of all time. When "I'm the Mountain" arrived, the whole place went totally down, crowning it as one of the best songs of the decade in this scene. We just can't get sick of Stoned Jesus. It seems like 1978 upstairs as the great Church of the Cosmic Skull await to begin at the Canyon Stage. This seven piece group gave us a performance with tremendous undertones of gospel like rock and reinvigorated neo-psychedelia. The equalization was slightly off and it seemed like they weren’t progressive with the full potential of both cello and female voice. Perhaps the in-between bits could be a lovely way of showcasing their particularities within the band. And is that Lionel Richie on the bass? Jokes aside it served as a palate cleanser nonetheless. Unsane is one of those bands that need to have a smaller stage to really pronounce themselves. They’ve lived all their career in the underground and that’s where they feel the most comfortable. We’d be lying if we said this was a first-timer, but it’s frustrating to see so much space in-between crowds when such an intense and powerful performance such as Unsane is being played. This is a band that after all these years can still deliver the same trademark sledge-hammer hit of a noise rock sound that both the new fans and the old school die-hard listeners all love to hear. Playing at the mainstage has some consequences when not a lot of people can be gathered, so it crossed our minds that it would’ve been more appropriate for both the band and their fanbase for them to play at the Canyon stage, enabling a packed place and a hot atmosphere, just like Conan and Mantar did the following day. Windhand was one of the most anticipated acts of this night. Dorthia’s voice is incredible and juxtaposed with the colossal riffage, to an extent that it almost carries the tracks, but she seemed a bit odd on stage almost like she was a bit nervous and sick. With a not so loud sound but yet very crystalline, Garret Morris did what he does best, hypnotic and deep guitar riffs at a slow and deadly pace, jam-packed by inventive changes. No soul should die without experiencing “Forest Clouds” live for once in their lifetime. Massive. With Windhand's act closed, we quickly tried to wake up from that meditative trance that we were dived in and tried to catch some minutes of OHHMS set. By the time we arrived at the Vulture Stage it was impossible to get a glimpse of them but fortunately they were possibly the loudest band around and we could hear them from behind the wall of people in front of us, fortunately not all was lost. Very profound riffs and a massive bass line who set the pace in this act. For the end, OHHMS bass player got on the bar counter and jumped into the middle of the audience, ending the gig laying down on the ground, totally exhausted. 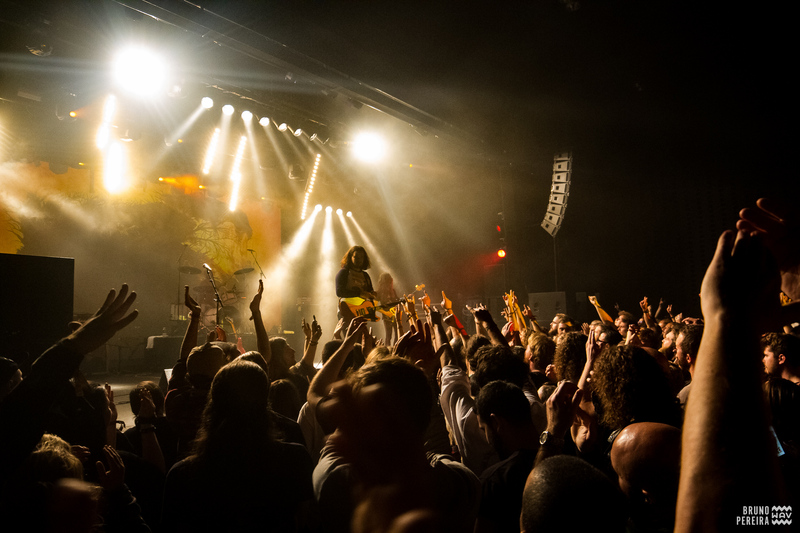 A glimpse of Satan’s Satyrs acid rock to dance and shake the doom off and was time for Graveyard and their recent rock ballad mood for people in love. A crowd that was denied in the last edition rejoiced in harmony. Enthralling psych tinted grooviness coated in uber cool vocal tones. Soft, enchanting atmosphere hypnotized by powerful vocals, driving riffs, and psych induced groove. They really seem to have found the place that they need to be and everything seems to have perfectly locked into place on a personal level, allowing them to put all their focus into the music and their performances. For those who weren’t fond of the new face of Graveyard, House of Broken Promises delivered an ultimately entertaining act of classic desert rock and showed us some of the new songs. Mike Cancino is an absolute animal behind their drums and Arthur Seay a show within the show. An hour evaporated in a glimpse, well accompanied with a glass of wine (courtesy of a portuguese friend) that had to be drank quickly for it not to end up on the floor with so much enthusiasm in the audience. Hope we can see these guys again next year, hopefully reunited on stage with their friend Garcia. We can dream, can’t we?